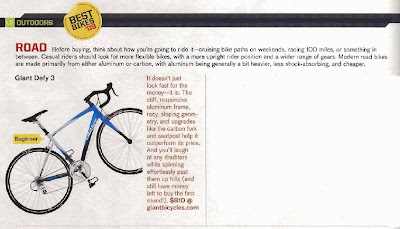 Century Cycles Blog: Men's Fitness select Giant Defy 3 as one of six "Hottest New Bikes"
Men's Fitness select Giant Defy 3 as one of six "Hottest New Bikes"
"It doesn't just look fast for the money--it is. The stiff, responsive aluminum frame, racy, sloping geometry, and upgrades like the carbon fork and seatpost help it outperform its price. And you'll laugh at any doubters while spinning effortlessly past them up hills (and still have money left to buy the first round!)."